Bee County vital records are kept by the Bee County Clerk in Beeville. 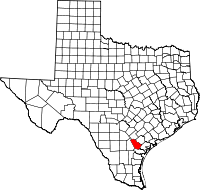 On December 8, 1857, Bee County was created from portions of five previously existing counties: San Patricio, Goliad, Refugio, Live Oak, and Karnes. Karankawa, Lipan Apaches, Borrados and Skidi Pawnees inhabited the land at the time of the first contact with Europeans; although these Europeans were Spaniards, it was the Irish who settled what was to become Bee County. Nevertheless, Hispanic residents now form the largest portion of the population. About half of the area of Bee County is prime farmland.